For using Nikon cameras with M42 lenses (Praktica, Zenit). Set on the adapter high-quality lens Jolos let you compensate flange bases difference of all the M42 lenses completely. So focusing can be to infinity. The high quality of the pictures is guaranteed. You should remember that extension ring doesn’t work, diaphragm control is set manually. 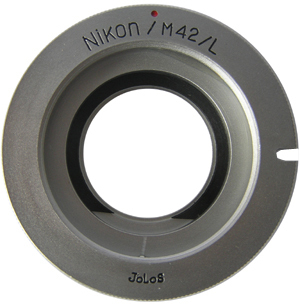 This adapter can work with lenses having both only automatic diaphragm (A) and selector A/M (automatic/manual diaphragm). It is possible to use Macro rings and other accessories. Approximate focal lengths: 50mm-1,5m; 85mm-3,5m; 135mm-6m.